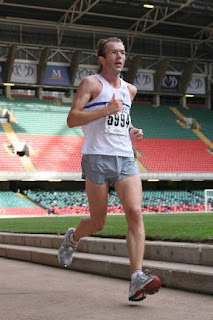 The Cardiff marathon and half marathon took place last weekend. It's the 100th anniversary of Cardiff's incorporation as a city, and the 50th anniversary of it controversially achieving the status of the capital city of Wales. Someone sympathetic planned the weather: it was cool and overcast and still, at least until the clouds parted for a glorious afternoon well after I'd finished. The weather was the only thing that was planned, however. The finish line was a mess. Fortunately Sean and I hit the finish line early, so we got a massage immediately on a fresh bed. Then we had to plough our way through a mass of sweaty men to collect our medals and goody bags. The medal came with a display case and ... no ribbon. What good's a medal without a ribbon? How are you meant to wear it in your post race stupor, feeling, through the weight around your neck, that you might have accomplished something? Medals are in short supply in academic careers, and when I get one I want to wear it for at least 12 hours, before it goes on a shelf somewhere. The plastic display case might look great down in the basement or attic or whatever, but I want to wear the thing. Unlike the T-Shirt, which is right up there with the worst designed race finisher T-Shirts I've ever seen. At least it's so badly made that the design will come off after a couple of washes. And then there was the goody bag. It was a small carrier bag which had an advert for a ford dealership on the outside, and inside ... two leaflets. And a banana. Plenty of room for the medal display case. 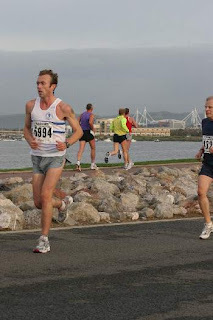 Still, I ran a good time, 1:25:13, a personal best (PB) by more than a minute. And I came 60th out of 4,200+ finishers. Not as good as Sean, however, who's undergone something of a moral reformation. And John, Sean's friend from Nottingham, finished his first marathon in a distinctive time. Photographs below. Admire the muscle definition. DON'T look at the shorts. We've all read that article about the beneficial effects of nitric oxide in Runners' World, but no one's mentioned this consequence. It must be that funny light in south wales. The first two shots are on the Severn Barrage, one of the nice stretches on the route; the finish is in the millennium stadium. But I'm still pissed off about the medal. I found a piece of ribbon that night and wore it the following day. With some satisfaction. I've not written up a lot of races this summer -- a bunch of 5ks, a couple of 10ks (I still haven't figured out how the 10k works), a couple of halves etc. This is the last before the New York Marathon on the 6th, a route already beset by injury and a head-cold. Say a prayer to your hearth gods for me.